While the panel was scheduled to visit Nilakkal and Pampa on Monday, it will visit Sannidhanam on Tuesday. The three-member monitoring committee arrived at Nilakkal base camp on Monday. Photo Credit: ANI. 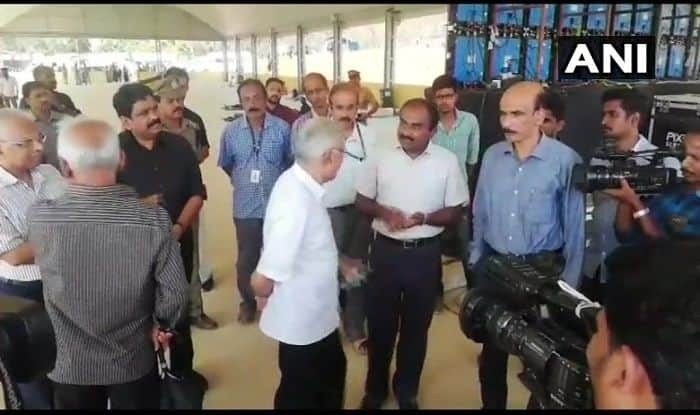 Thiruvananthapuram: A three-member committee appointed by Kerala High Court to monitor the situation in Sabarimala arrived at the Nilakkal base camp on Monday. The committee was set up by the court following complaints of inadequate facilities at the hill shrine, stated news agency ANI. The committee was appointed to ensure smooth pilgrimage to the shrine temple. According to a report by The Indian Express, the panel of observers was scheduled for a two-day visit to the hill shrine starting Monday. While the panel was scheduled to visit Nilakkal and Pampa on Monday, it will visit Sannidhanam on Tuesday. Meanwhile, Kerala Chief Minister Pinarayi Vijayan and Leader of the Opposition Ramesh Chennithala got into a war of words in the state assembly over the Sabarimala Temple issue. This escalated disruptions in the House proceedings for the fourth day. “It’s the first time that a CM has provoked everybody and stalled the House. Section 144 should be withdrawn in Sabarimala. We’re requesting more facilities for pilgrims coming to Sabarimala, Pamba and Nilakkal,” said Opposition leader Ramesh Chennaithala. The House was adjourned by Speaker P Sreeramakrishann. The exchange of words, however, continued with the Congress-led Opposition UDF MLAs shouting slogans and the CPI(M)-led LDF members standing up from their seats. The hill shrine of Lord Ayyappa has been witnessing a series of protests from devotees and right-wing activists against the CPI(M)-led LDF government’s decision to implement the Supreme Court’s September 28 verdict. As per the verdict, women of all age groups are permitted to offer prayers at the temple. On Sunday, a four-member delegation of Bharatiya Janata Party (BJP) Members of Parliament (MP) submitted a complaint to Kerala Governor P Sathasivam seeking his urgent “intervention and appropriate action” to restore “peace and tranquility in Sabarimala Temple”. They also mentioned the difficulties faced by the devotees and lack of facilities in Sabarimala.